Compatible replacement crevice tool for Dyson DC16, DC30, DC31, DC34, DC35, DC44 & DC56 handheld.. Compatible replacement combination tool for select Dyson vacuum cleaner models. Debris nozzle con..
High quality compatible spare part to fit your Dyson DC16 vacuum cleaner ..
Genuine Dyson DC16, DC24, DC30, DC31, DC34, DC35, DC44, DC47, DC50, DC56, DC58, DC59, HH08, SV0.. This adaptor tool is a genuine spare part for universal Dyson vacuum cleaners .. Replacement Dyson vacuum cleaner combination tool. The debris nozzle on the combination tool convert.. 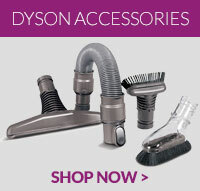 Compatible Dyson DC16 handheld vacuum cleaner filter. Regularly cleaning and replacing your DC16 fil..